The new Toyota Hilux is an iconic pick-up van featuring a redesigned frame with a body structure specifically designed to be as tough as they come. The Hilux Double Cab vans also boast new high-quality interior design features which combine with the improved towing capabilities to make these new Hilux vans the ultimate pick-ups on the market. No matter what stresses, strains and terrains lie ahead, nothing fazes the new Toyota Hilux. Vans in the Toyota Hilux range are available to buy now for affordable prices from UK Vans Direct. The 4-wheel drive Double Cab Hilux has a towing capability of 3.5 tonnes with a maximum payload capacity of 1130kg. The Double Cab deck measures 1525mm long and 1540mm wide. 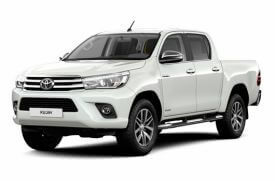 There are automatic and manual transmission versions of these Hilux pick-up vans available, with both using a 2.4 litre diesel engine renowned for its powerful performance. The Hilux engines demonstrate exceptional acceleration, particularly in the low-to-mid RPM torque range. Plus the engine’s fuel efficiency has been significantly enhanced. Special attention has been paid to the noise levels created by the engine, with a noticeable reduction compared to previous models. Toyota Hilux vans are available now from UK Vans Direct with prices starting from £23,536.00 plus VAT and Road Fund Licence. There are also several hire purchase deals available starting from £393.84. Delivery of the van is free of charge. For more information about these tough Toyota Hilux pick-up vans, call our team of Toyota van experts on 01709 717200.